Product News - Stähle’s Website! New development with highest focus to safest possible, most flexible and simplest use and operation. November 2016 - Take advantage of the new comfortable, simple and consistent operation with new designs and new features. For thi all- new design highest priority was set to a most simple and consistent useability. Dialogs and procedures have been optimizef for a minimum number or required mouse clicks. February 2014 - System to fix the steering wheel angle during a vehicle test. The freely turning steering wheel of a vehicle can be fixed to the actual angular position by an external command. This allows to perform repeatable tests in vehicle dynamic testing where the angular position of the steering wheel has to be fixed at certain conditions/situations. The actuator is placed on the driver seat. There additional weight scan be mounted to simulate teh specified weight of a human driver. Alternatively the actuator can be fixed onto the driver seat. Optionally a horizonted pedal stroke measurement can be added in addition to the measurement of pedal stroke and force in the actuation direction. February 2013 - Steering system SSP3000: New drive variant with 2500 °/sec at 85 Nm available! A new drive variant is now available for the Steering robot SSP3000, which offers highest steer velocity of 2500 °/sec at 85 Nm torque and together with a small size. Especially for vehicle dynamic tests and automatted driving of vehicle on proving grounds and test tracks we developed a special generation of Autopilot, which allows the use of the driver seat by a driver together with the mounted robot actuators. The new steering pilot SSP-FrontFree guarantees the mounting of the actuator without interference of the airbag area of the original steering wheel. The brake actuator with intergrated redundant safety technology ensures an ABS braking even in case of poer shortage. The newest release of the Autopilot32 software allows to use the Autopilot systems to determine the range of electric vehicles according to the different regulations. July 2010 - Fast fixture of the robot driver to the seat rail - fast alternative to belts ! The robot driver is fixed quick, stable and safely to the seat rail using a universal adapter. This option is available for the Autopilot Systems of the SAP2000 series and actuators AP-*. Fieldbusses such as CAN or PROFIBUS as well as others can be connected via gateways for elegant, robust and real-time capable data exchange. This system allows precise durability stress testing for pedals and shift lever as well as safety (parking) brake mechanisms in the vehicle with dynamic and static loads. Based on the SAP-RAPID-HE series, this custom system supports various versions of safety (parking) brakes as well as different configurations of shift levers such as floor shifter, column shifter and dash board shifter. 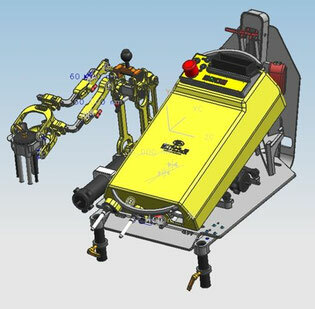 December 2009 - the first STÄHLE Autonomous Driving Actuator System was put in operation. With this autonomous driving system the sensors and strategies of active collision avoidance systems of different vehicles will be tested and optimized. November 2009 - Release of the new designed shift hand (grabber of shift lever knob) with integrated force measurement. Due to the mechanical design of the shift actuator with the spherical motion and the special application of the sensors, the forces are measured always as applied orthogonal to the shift knob in the X and Y directions, independent to the angle of the shift lever. The grabber can be adjusted to the size of the shift lever knob. 2008 - Release of the all-new Autopilot Real-Time Software Autopilot32 with new out-standing vehicle speed control and various new features. The application runs under the real-time operating system INTIME from Tenasys as add-On to Microsoft Windows XP. Various new features with outstanding performance.